To protect their thriving industrial world, the Balmorran government commissioned a series of tightly sealed underground vaults for storage of the toxic waste produced by the planet's many factories. One of these, Hazard Vault 305, was built into a pre-existing cave to collect the waste from the Balmorran Arms Factory; the Balmorran government did not suspect that the cave had been used by the Sith Lord Tulak Hord to hide one of his artifacts. 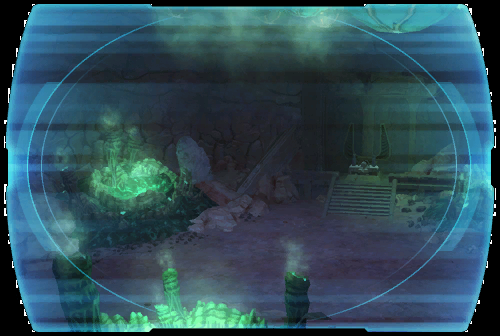 During the Imperial invasion of Balmorra, missile barrages damaged the hazard vault, causing its contents to leak and providing a way inside for anyone capable of surviving the deadly waste. During a protracted period of economic depression two hundred years ago, the Corellian government commissioned a morale-building museum to celebrate the planet's greatest technological and industrial achievements. Twenty years and hundreds of millions of credits later, the Museum of Corellian Industry finally opened to tepid public response. When Republic forces regrouped in Axial Park, they quickly secured this remote and mostly-abandoned museum as a staging area. Darth Thanaton, sensing opportunity, personally eradicated the Republic forces occupying the sturdily built structure. Rather than reporting this victory to Imperial leaders, he instead made the museum his own private bunker.